Second son of the late Captain Edward Fulcher, 87th Royal Irish Fusiliers, Was born in 1855, educated at Westminster, and served for twenty years in the Yeomanry, for thirteen years in the West Kent Yeomanry, and seven years in the Suffolk Hussars, retiring as Hon. Major in 1897. 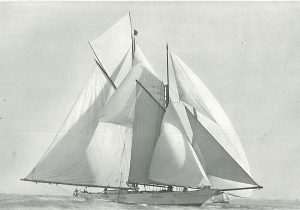 Roseneath, Schooner. Mr. A. W. Fulcher. He commenced yachting in 1886, and his first yacht was the 62-ton schooner Eurelia, followed by the Roseneath, a I 95-ton auxiliary schooner, then the 119-ton schooner Algeria, and the 27-ton yawl Grade; and in 1898 he built the new Roseneath, a 54-ton schooner, which, famous in her day, carried off the Emperor’s Cup in 1899 and 1900. In 1899 he competed for the Queen’s Cup with Roseneath, and in the same year Lord Normanton joined him in the part-owner-ship of the same yacht, and competed in the Dover-Heligoland Race. He was also a joint owner of the Villaya, which he raced through the season of 1903 with the Solent one-design class. In 1905 Mr. Fulcher sold the Roseneath, and acquired the yawl Xenia, which he rechristened the Kestrel, and con­verted her into a ketch. Besides taking a great interest in the sea, Mr. Fulcher is a good all-round sportsman, having played in the Kent cricket eleven, is a fine shot, and rides well to hounds. Clubs: Royal Yacht Squadron, Royal Dorset, Royal Cinque Ports, and Castle. Residence: Redenham House, Andover, Hants.